And big thanks to kolonel Designs for their lovely review. Hi, I’m Marieke van de Rakt. I’m the CEO at Yoast. Together with my partners Joost de Valk, Omar Reiss, and Michiel Heijmans I run Yoast. Next to my focus on growing and maintaining a company, I am very much involved in creating our products (both the plugin as well as our online courses) and writing for Yoast.com. Also, I lead our research team, our blog team, the academy team and our project management team.In a previous lifetime, I obtained a PhD in social sciences. Kate Toon: Many people think of SEO as an afterthought. 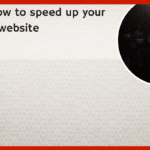 You build your website and then you smear a thick layer of SEO icing over the top. But SEO is not the icing, SEO is the cake itself. Structuring your website well is essential for both usability and findability. Not only does it help your customers find the content they need, it helps Google understand your site better. 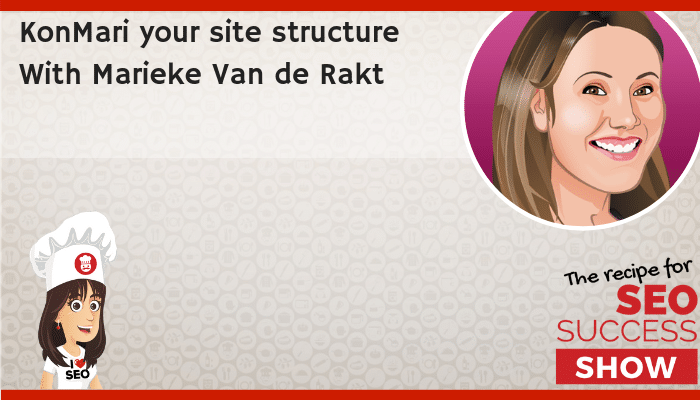 Kate Toon: In this week’s podcast, I’m honoured to have Marieke van de Rakt on the show to take us through how to create a well-defined site structure that woos humans and the Google gods. Hello, my name is Kate Toon, and I’m the head chef here at The Recipe for SEO Success, an online teaching hub for all things search engine optimization. And I love SEO. And today, I’m talking with Marieke. I’m not going to try and say her second name again because I’ve already got it wrong. Hello, Marieke. Marieke: Hello, very nice to be here. Kate Toon: Very nice. Can you say your second name properly for me? Marieke: It’s Marieke van de Rakt. Kate Toon: Marieke van de Rakt. Is that better? Kate Toon: That’s pretty good. It’s Dutch. Kate Toon: Mine’s actually Kate Toon, but everyone says Kate Toon, but I just go with it, you know? I’m joking, not really. Well, let me start by reading your bio. So, rather excitingly, Marieke is now CEO at Yoast. We’re going to talk about that in a minute. Together with her partners Joost de Valk, Omar Reiss, and Michiel Heijmans. God, these Dutch people and their crazy names. She runs Yoast. 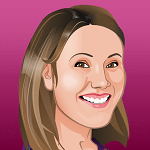 Next to her focus on growing and maintaining the company, she’s very much involved in creating their products, both the plugin as well as their online courses, and writing for yoast.com. She also leads the research team, the blog team, the academy team, and the project management team. So, essentially, you do all the work. Is that right? Marieke: Well, I do all the planning. Yeah, I think I don’t do all the work. I do a lot of work, but I think … So, Joost, the husband and the founder of our company actually is the most creative, I guess, and father of our plugin, so he’s very important as well. Kate Toon: Yeah, he doesn’t just build Lego. But I think we were talking earlier about sort of playing to our strengths, and I’m quite an organised person, you’re quite an organised person. So, it’s pretty exciting because this new move is, at the time of recording, very new. Marieke: Yes. It’s very exciting. Yeah, well, in our company, nobody was surprised because they all look at the four of us as the bosses. And I’m the one that’s most organised. So, I take charge and I plan things, so they all know that. But outside the Yoast bubble, people were surprised. So, I got an invitation to speak at an event instantly, which never happened to me before, so really excited about that. Yeah. Kate Toon: Well, that’s awesome. And you know, we were saying again before the show that there are, I guess I think it’s fair to say, fewer women in senior roles in technology companies, so it’s great to have people like yourselves being an inspiration to other women in the industry. So, awesome. Marieke: That’s awesome. You too. Kate Toon: Go us. Well, look, we won’t get into a big thing on feminist power, although yay for feminist power. We’re actually instead going to talk about website structure power. Kate Toon: So, those of you … we’ve couched this episode as a newbie episode, although I think that to be honest, a lot of more technical SEO people overlook this a little bit. But hey, for those of you who don’t know what we’re talking about when it comes to website structure, we’re talking about the way you set your site up. The way that pages relate to each other, the hierarchy. And of course, good structure is useful for human, it has a real impact on UX or user experience. If people can’t find the pages and the products they’re looking for, they’ll hot foot it out of your website and off to someone else’s. So, a clean and easy to understand structure can help with this. You need to account for new visitors, repeat visitors, people who have different needs and functions and ensure that all your priority pages are easy to find. So, for me it makes perfect sense from a human point of view. But why does Google care about site structure? Marieke: Well, Google is a search bot, or consists of a search bot, and it follow links. So, Google comes to your website and then starts to save all the content in the index. And it does that by following the links on your website. So, the links on your website, the internal linking structure is like a guide for Google. “Oh, I’ve been here before, and now I am here again. This might be important.” So, that’s the way it works. Kate Toon: way that most people who do site architecture or information architecture or site structure, whatever you want to call it, they kind of work on a pyramid structure with your homepage at the top and then the next level. I like to think of it as a champagne tower. where you pour the champagne in at the top and it dribbles down. So, I really hope there’s going to be one at your conference because otherwise I’m not going to come. So, do you feel like it works like that, that the most juice is in the homepage, the most champagne, and then it trickles down. Do you think that’s a fair way of structuring it? Marieke: If your website is not too big, I think it will be like that. But in our website at yoast.com, I think we can’t just focus on that homepage anymore. So, you have to have multiple champagne towers and build it up like that. It’s only better. But I do think that in the end, your homepage is going to be the page that’s most linked to by other people. So, that’s always a really important place. But as a landing page, I don’t know. People aren’t searching for a homepage, they usually are searching for kind of information. And you need to find that proper landing page that fits with the search intent of the people. Marieke: To think about site structure in the way of champagne towers is the correct way. And it’s like, no, because you actually want them to come in on one of those sub-champagne towers where it’s the area all about topic X or topic Y, because really, the homepage is like the magazine cover where there’s loads of different topics and articles and you don’t really know … even if it’s the best designed homepage in the world, you’re faced with multiple choices. And really, we want to give people not as few choices as possible, but we want to make the focus really clear and give them a really clear path. Do you agree? But then again, if people are coming back, you need to have a homepage that’s really nicely branded, that people instantly see, “Oh, this is …” in our case, Yoast, or, “This is the website I want to go to,” because if you do your search really good, then in the end, people will find your website without even going to Google. So, that’s the end result. And then you need to have a homepage that’s appealing and that will serve or show people where they have to go. Kate Toon: Yeah. And I think it’s really important as well when we think about that that a lot of the analogy I use is kind of a backdoor SEO approach. Like, people put a lot of effort in to their homepage, their front door. It’s beautifully designed. It’s got their number on and where they are, who they are, what they do. And then you get into the sub-pages. And honestly, if you land on there straight from search, you’d have no idea who the company was, there’s no call to action, there’s no phone number. There’s no … and it’s like, “Where am I?” There is nothing else. It’s so important to just be aware that, yeah, great, people came to your homepage and made that choice, but they could end up anywhere. They could end up anywhere on your site. Marieke: Yeah, they’ll probably end up somewhere else. That’s the reality of search, I guess. Yeah. Kate Toon: So, if we’re talking about the homepage, and you just mentioned that the homepage plays an important role as the sort of navigation hub for your visitors, what are your important homepage tips? Like, if I’m thinking about site structure, what should in include on my homepage? Marieke: Well, I’m not a UX expert. I actually, I’m not a design guru and stuff, I really don’t care much of the time. So, that’s not a good thing. But I think people should look at their menu. And in the case of site structure, that menu should reflect what you’re actually doing on your website. And I see a lot of cases in which the menu is just like some categories, but doesn’t even relate to the mission or the thing you want to do with that website. So, just thinking about, “What is it that I want people to do here? And does my menu reflect that?” That’s a good idea, I guess. Marieke: And while you are writing, so if you have a blog, and you’re writing and adding stuff, then you have to re-evaluate your categories and your menu regularly because you probably are blogging about one thing much more than another because that’s the way humans are. And then you have to make sure that’s well balanced again. Kate Toon: Yeah, I agree. And I think it depends whether you’ve got a service site or an eCommerce site. One thing that commonly irks me about eCommerce sites is that their primary navigation or menu is not product focused, it’s all like about, FAQs, whatever. And it’s like, no, no, your primary nav should be the core product categories that you have so I can come in and get an idea of your whole store just by looking at your navigation. I should be able to work out what you do just by looking at your nav, pretty much. Kate Toon: I think another thing from a copywriting perspective is I don’t think navigation’s a place to be playful with language. If it’s a blog, call it a blog. If it’s a contact page, call it contact. Don’t be cute in your navigation because people actually shouldn’t think about what they’re clicking on in your nav, they should do it so intuitively. Marieke: Yeah. It’s too bad you can’t be cute in your navigation. Kate Toon: Don’t be cute. You can be cute everywhere else, but not in your navigation. And I think people have real issues with site navigation. What are the common problems that you see with people with structuring their primary navigation, for example? Marieke: I see people using too many tags, so people just come up with a tag with for every new blog post. And then Google gets confused because that doesn’t add structure at all. It just adds stuff. Kate Toon: Just noise. Just noise. Marieke: Yeah, so people like to add things and that doesn’t make it better necessarily. Kate Toon: I mean, I see a lot that people just put too … You know, your navigation is supposed to narrow down the choices, so having 465 things in your navigation isn’t helping anybody. And also, having one category, as you said, one category that’s got 300 sub elements in it and another category that’s got one, so navigations that are really uneven, poor names, as you said, squished together. We’re not talking about site structure here, but you’ve really got to consider that you get those drop downs that drop down and then they drop again and then they drop again. Kate Toon: And you can’t get your mouse over it and it keeps going back up and you’re like, “God, no.” And just nonsensical things being in the wrong place. Like, I saw someone today and they had a contact page. And under their contact page was their team page, their testimonial page, and their about page. And I was like, “Why is all that there? What?” I often with navigation say it should follow kind of the sales process. It’s like who you are, that’s your about page. What you do, your services, whatever. Your proof, which is your testimonials, your gallery, your sample or whatever. And then the get in touch. Kate Toon: It’s not comprehensive but it’s pretty much like it’s if you met someone at a networking do. You explain who you are, what you do, maybe show off a bit, and then give them your business card. And I think a navigation can follow that. That’s my little rule, anyway. Kate Toon: I think they actually did plan it, which is more upsetting. I think you’re so right. You try to build a site with a bit of longevity in mind. You think, “What do I want this site to look like in a couple of years’ time? I mean, I don’t think any sites can last much longer than that without some kind of rejig. But yeah, I do see sites that are like seven, eight years old, and they’ve just stuck stuff on wherever they … and it’s like, “You need to stop and take a step back and maybe restructure and re-architect.” Yeah. Marieke: Yeah, clean up the attic or the garage or something. That’s the same with buying a house. We’ve been living in our house for five years and we stuffed all our stuff in the attic. And now we have to clean up because it can’t go anywhere. Kate Toon: Do you have Kon Marie where you are on Netflix? Everyone here is obsessed with Kon Marie. Marieke: Maybe we should … we should let … I think site structure and Marie Kondo could really go together. Kate Toon: Now, one thing that Yoast kind of brought to the fore and kind of talks about a lot is cornerstone content. Kate Toon: Can you explain the concept of that and what you mean by that? Marieke: Yeah, I think we kind of changed our ideas about that. But basically it is that you have a number of articles or landing pages that are really, really important. And those are usually well-written. They are informative. 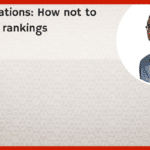 They are focused on your most hard keywords to rank for so that the things you really want to rank for, and then you write these really nice lengthy posts about it. And then you have all kinds of other little posts that all link towards that one and most important cornerstone content page. And we used to say or advise that these should always be informative. But I don’t agree with myself anymore because I think there could be eCommerce pages as well that should rank. So, in our case, we want people, if people are searching for that Yoast SEO premium plugin, we don’t want to bore them with all kinds of information. We just want to let them see where they can buy our products. So, that could be a cornerstone page as well. And we should treat them in the same way that all of the other pages should link towards that one most important one. Kate Toon: So, it doesn’t just have to be a blog post, it could be a product page. It could be a sales page. Marieke: Yeah. It should be … I always say, which pages do you want to put on top of your bow? If you get out and let people read about three or four of your pages, which ones would that be? And these should be your cornerstones. Kate Toon: I love that idea. It’s just about focus again, isn’t it? If people could only ever look at five pages on your site, which ones would they be? Kate Toon: And then once you’ve established that, “Look, I think this is a piece of cornerstone content,” you say that you link it from those kind of lesser pages. Kate Toon: But do you also recommend linking to it directly from your homepage, like deep linking to it from your homepage? Marieke: Yes. I guess, if you don’t have too many, you should do that because these are your most important pages, so you want people to easily get from your homepage to that most important page. So, from a navigational perspective, it’s important. And also, your homepage usually is the one that gets the most external links from other pages. So, it’s deemed important by Google. So, having a link from that homepage is really important. But in our case now, we have like 20 cornerstone content. We can’t all put them on the homepage anymore. So, if your sites get bigger, that’s really hard to do still. Kate Toon: Yeah, you just pick five or six must reads. And another option that I see a lot of sites doing is because of that problem of having too much cornerstone content, they have a page like a start here page, start here. Something that Pat Flynn has on his website, which works very well. And it’s like, “Look, I talk about all these kinds of topics, but here’s my number one topic about podcasting, my number one piece of content about affiliate marketing.” And that becomes a nice sort of sub page to really illustrate his cornerstone content. So, there’s different ways of doing it, I think. Kate Toon: Now, let’s talk about taxonomies. Love a good taxonomy. This is going to get Marieke very excited. Kate Toon: It’s a fancy term for a group of things that have something in common. Kate Toon: So, you can group things together in different ways on platforms like WordPress. So, we have taxonomies of categories, of tags, of authors. What are your tips around this? Because it’s a bit overwhelming for people, I think. Marieke: It is. So, whenever I start thinking about it, I get confused. So, I would say, of course you use categories because you want to make things more structured. Make sure your categories are about the same size because otherwise it doesn’t make sense. So, a good rule of thumb here is if your one category is getting twice as big as another category, then you should break it down. We already talked about tags and that you shouldn’t add too many. That’s something people just love to do, and then it doesn’t add anything. So, you want to make it simpler. You want to make pals out of all these different pages you have, so you should make sure that you’re actually creating something there. Kate Toon: And with tags, I mean, tags for me feel like a bit of a throwback again to when we all had beautiful little tag clouds in our sidebar, which we don’t really do anymore. I must admit, I don’t really even add tags anymore. And I think I see people adding like 50, 60 tags, copywriter, copywriting. And it’s like, it’s become so much keyword stuffing in the end. Marieke: When you do do tags, we actually turned it around. So, we now have categories that say, “This is a basic article, and this is a video.” And then we have tags which say, “This is copywriting, this is about structure.” So, that’s the way you can do it as well. But you should think about, “What am I structuring? And does it make sense?” Actually, all the things about site structure is just, you should really think about it. And I think thinking about it in a Marie Kondo way is the best. Kate Toon: I really do. Marieke: Just think about it, about cleaning up, that’s the thing. Yeah. Kate Toon: If you’ve already got your site and you’re listening to this thinking, “Oh god. I need to Kon Marie my site.” How do I go back? I mean, what are your recommendations? How do I understand all the content I have and then take that step back and re-plan it? Marieke: Well, if we are talking about Marie Kondo, I would think that you should pile it up and you should think about which articles spark joy to you. Kate Toon: Which pages spark joy, I love that. Marieke: Because that would be the ones that you would put on top. That would be your cornerstones. And maybe you never thought about cornerstone content before, but the ones you want to rank highest with, these are your spark joy articles. These should be the ones that you link to from all of the others. And then they will start ranking because you’re telling Google, “This is my one most important page.” And Google will think, “Oh, that’s the one I should come up with in the search results.” So, it really works. Kate Toon: It really does. And something that I did a couple of years ago, because you know, you start writing blog posts and when you first start out, they’re rubbish, you know? They’re rubbish, the first things you write. So, I had like eight years worth of blog posts. And I had to go through them and go, “Which ones spark joy?” And the ones that didn’t spark joy, I either had to delete and redirect or combine them together to create … you know, you’ve written three 200-word rubbish articles, maybe you could make one mega article and then either re-publish it or link to it. And just cleaned it up. I literally created a spreadsheet, and I’ve got it on the site if anyone wants to download it. It’s like a content audit. And you just go down each post and you go … it’s almost like keep, proofread and edit, delete, combine, whatever, redirect. Marieke: I think if you don’t do that, you’re actually competing with yourself because you’ve probably been writing about virtually the same thing. So, we still have this on our site though. I wrote an article about readability, and I wrote another article about readability. And they’re really two different articles, but I don’t think Google will notice that. So, we should combine them. And if you have a lot of junk on your website, even if it’s quality content, you should think about, “Well, is Google going to show two results from my site?” Probably not on this term. So, then combine them and make them more awesome. Make one awesome article instead of two mediocre. Kate Toon: It’s funny because I’ve got two articles, I think, one is what is a copy deck and the other one is how to write a copy deck. And they’re very similar, do you know what I mean? Kate Toon: But Google at the moment still ranks the separately and positions one and two for copy decks, so I’m leaving those babies alone. I ain’t touching them. Kate Toon: But one day I might combine them into a mega post or write a whole new post and redirect those two. Just for those of you who are listening who are newbies, when you delete content or you don’t want to show a blog anymore, don’t just delete it. Marieke: Yes. I know a good one. Kate Toon: Would it begin with Y? Would it begin with Y? And you can use the professional version, the paid version of Yoast, and you can redirect those posts to each other so you don’t lose any of that champagne. Marieke: It’s also combining two articles who are basically the same isn’t going to have a bad experience for anybody because if they follow a link that was pointing towards that article, they’ll still find that. So, that is just fine. Kate Toon: Yeah, it will satisfy their user intent. Marieke: And if it satisfies the user, it will also satisfy Google. Kate Toon: So, let’s talk about another part of site structure, and this is something you’ve written about as well, which is contextual linking. So, for those of you who don’t know what contextual linking is, this refers to internal links on your site that refer to other pages on your site, as opposed to external links, which kind of link out. So, it’s internal linking, but it’s within the content. So, it allows people to continue their journey. What’s your best advice about contextual linking, Marieke? Marieke: It’s just like … it doesn’t matter … So, Google will follow links no matter what, at least for indexing. So, it will just crawl through your site and go through all the links and save all the content in the index. So, you can put just internal linking in there and not think about it, just link to random pages. But that, of course, is not a good user experience, and Google will notice that because Google’s more and more able to determine how pages are related. And so, if you’re using contextual linking, you’ll actually be linking towards a page that makes sense, that will let readers keep on reading, that will elaborate on it. All the links will be useful and logical. So, that’s what you need to do. Kate Toon: Do you think there’s any limit though? Because I often see sites where the first paragraph is like, “We do this. Link this, this, this, this, this.” It’s link, link, link, link, link. And I kind of limit myself to one or two contextual links, maybe even one per paragraph because I sort of feel every time you see that hyperlink thing, it’s kind of a bit like shouting a little bit. So, too many links can be overwhelming, can’t it? Marieke: And if that’s your feeling, then it’s true, I guess, because if it feels like a trick, then it probably is a trick and you shouldn’t be doing it. But at the other side, Wikipedia does that a lot, and these are all useful links. And we all know that if something is a link in Wikipedia, you can go to another page. So, it pretty much depends on how you are doing it, I guess. And if there really are good contextual links, Wikipedia is doing awesomely in Google. So, I guess that structure is a good idea. But if you feel like I’m overdoing it or I’m stretching it, then you should never do it. Then you are going the wrong way. Kate Toon: And this is something that you and I are both quite passionate about with SEO copy writing, and it’s the topic of my talk at Yoast Con is like, if it’s starting to sacrifice the engagement and the enjoyment of the copy, then you need to pull it back a little bit because we want to be helpful, but we also want people to keep reading. Love Wikipedia, squeeze Wikipedia, but it’s its own type of beast, and especially when you’re writing conversion copy I think. And I guess, an important thing to talk about here is, when we talk about contextual linking … now, I know the answer to this, but I’m interested to hear yours for the audience, a lot of people tend to wrap that link around words like, read more, and click here, and go there. So, what are your recommendations on how we build our links? Marieke: You should not do that because Google wants the links, so they will use the words you put in your links or the text you are making hyperlink in. They will use that to see whether or not that’s actually a useful thing. So, if you are writing about ballet shoes and you have different blog posts about a ballet school and in both those links … or the link you are making, the words ballet is coming up, then Google could notice, “Hey, this is actually a good contextual link.” And the other thing is that that read this doesn’t say anything, so this doesn’t make people click. So, it’s not a user good experience, and it’s also not a good Google experience. Marieke: In our blog we have the read more links who are between paragraphs. And they actually work pretty good. But then there’s read more about, and then you have like a long sentence. So, you have to context your words in it as well. Kate Toon: Yeah. I think there’s a place for both, just as there’s a place for buttons and whatever. I don’t think it’s about giving people options, but if you’re in the midst of a paragraph, you don’t want to jerk people out of that sentence with a click here. You want to just … you’re writing about ballet shoes or Piglet jumpers, just make the word Piglet jumper the link. It’s easy, and then people can choose to click on it or not. They do draw the eye as well, just like any kind of formatting on a page. The links will pop a bit more than the rest of the copy. So, they can also be quite … have kind of an impact on readability and scanability of the page if it’s link, link, link. Kate Toon: Now, we’ve talked a little bit about this already about just having too much content and just overdoing it. Kate Toon: Lots of people recommend, “You’ve got to keep adding content to feed the Google beast. Google loves fresh content.” What do you feel about this? I mean, obviously you guys are prolific, you’re a company, there’s lots of people working there. You can pump out the content. But your average small business owner, we just can’t do it. Do you have any recommendations about frequency, consistency, regularity? Marieke: Well, you should only write if you’re really adding something to the junk that’s already out there. I think that’s the rule. And I think if you want to grow an audience, it’s good that they know when to expect something, so that could help. And then, it doesn’t really matter how often you write, but if people know, “Oh, she’s going to blog every two weeks,” that could be like a good routine for you. And then your readers will also know what to expect. So, I think it’s a good thing to keep in a certain pace or in a certain routine. Even if you are adding quality content, and you should keep doing that, you should also clean up at the same time. So, just adding stuff isn’t going to work anymore, I guess. Then you have to clean up at the back end side of your website and edit those posts you wrote eight years ago. Kate Toon: Exactly. And I think a lot of you, you might find if you do this clean up, there’s actually you’ve got an awful lot of great content as well. And the way that all the social media algorithms work, putting SEO aside to a degree, I re-publish my content so frequently, and still people maybe who have followed me for five or six years, it’s still the first time they’ve ever read it just because Facebook is a bit of a git and doesn’t show it very often. So, my advice is always … I don’t think Google necessarily rewards consistency or regularity. I think it rewards the best content. And that’s why sometimes the piece of content you see is a couple of years old because Google deems it to be the best. So, newness … apart from the query deserves freshness thing where it’s kind of some kind of news story, newness isn’t everything. I think quality is what we’re saying is the point. Marieke: And improving upon article also shows Google that that content is alive. So, you don’t have to rewrite the whole thing. But in SEO things change, so adding a paragraph in which you explain the newest things could be well enough and then you can republish the whole thing again. Kate Toon: Exactly. Are you of the school of thought that if you’re updating an article, you should just kind of put a little updated statement? Or do you actually change the publish date? Or do you actually write a whole new blog post? What’s your advice on that? Marieke: We do all those things. Kate Toon: Okay, you mix it up. Marieke: Yes. It all depends on the article. So, sometimes we write an entire new article, sometimes we add a little content and don’t republish, but make sure that it’s still valid because you want the content people find should be valid. So, we have a lot of articles about our plugin, and then our plugin changes. And then we need to rewrite all of these articles, and we’re not going to republish all of them. But we will add new content because we want to make sure that the content still is valid. Yeah. Kate Toon: And just on that, which is an aside, nothing to do with site structure, a lot of people now turn off the publish date so that it looks more evergreen and looks more up to date. What are your thoughts on that? Marieke: We don’t do that. Kate Toon: I think it’s a bit dishonest. I like to see the date, you know? Marieke: And it’s also for a reader to see, “Oh, this article’s two years old.” That can be a good thing to know because they then know, maybe this isn’t the most recent article. Yeah, no, I think it’s a bit dishonest as well. Kate Toon: Yeah, and on the flip side, if it’s old but still valid and getting a lot of shares, it’s a sturdy bit of content that has stood the test of time. Kate Toon: Because not everything we write about changes. Kate Toon: If it’s an opinion piece or something. Kate Toon: Still valid. Yeah. Yeah, exactly. So, I’ve got a question from a member of my Digital Masterchefs community and she said she’s working with an electrician. We love these tradies and their local pages. So, he wants to rank locally. And we all know that local pages can be very thin and have bad content and all they’ve done is change one word at the top. But she says he has a lot of hidden pages on his site, so pages that are on his site but you can’t get to them from the navigation or from the home page, they’re just there. Kate Toon: They’ll be in his site map, obviously. Why? Well, that’s the question. What do you think of that? Hidden pages. Marieke: Yeah. I don’t understand the concept. So, I think if you want to add content to your website … I see people doing this, and I never understand why. You should at least get to that, because if a person can’t get to that site, Google can’t get to that page either because it needs the links to follow it. So, probably it has like one link from the site map or something, but still, that’s really few. So, it will never be properly indexed if you’re hiding away your pages. Kate Toon: I think it’s about shame. Like, looking at the pages that they have, they were just really bad pages, and it’s like, if they’re that bad, don’t hide them, get rid of them, do you know what I mean? Kate Toon: Or write better content. Kate Toon: Now, I’m going to share your fabulous Yoast Guide To Site Structure in the show notes for the episode, so you can head to the blog to read that. But just to summarise, just to finish up, what would you say the biggest problem you see people making with their site structure? What’s the commonest pitfall you see people falling into? Marieke: Nowadays, and I talk about this a lot, is the overwhelming amount of content people are creating. And I think that’s because we’re all in this field for some time now and just starting to notice that we have too much stuff. So, that’s what we are facing. I also think that people … So, I think site structure is really closely related to keyword research. So, thinking about which pages are want to be found for also requires to think about which keywords are people using to find that? So, you should combine those two and don’t see them as separate topics. So, I guess that’s something I see people doing as well. I think people just don’t think about it enough. That’s the main problem. Kate Toon: I think that’s the main problem. I think it’s taking that step back before you even start to think about what you want your site to look like, rather than hurtling in, and to think about it from a user perspective. And to think about everything you’ve said. You know, like if you’ve got content that’s optimised for a particular group of phrases, don’t then go and create other content that’s going to compete with it, duplicate keyword cannibalization. You know, don’t fight within your own site. For the love of god, you’ve already got thousands of other people to fight with. Marieke: Yes, you have enough other people to fight with. Kate Toon: Yeah, don’t do it on your own. And I think less is more. I think clearly the episode title for this episode needs to change and it needs to be how to Kon Marie your site structure. Marieke: If it doesn’t spark you joy, get rid of it. Marieke: You want to redirect it. Yeah. Kate Toon: That’s going to be it. Get Rid of It (301 redirect). Perfect, boom. Marieke, thank you so much for coming on and talking about that and making it a bit of fun. Like, I think people are frightened about site structure, but a lot of it is just common sense and just really thinking about it from a user perspective. And Google will follow and everything will be lovely. Kate Toon: So, I hope this episode has sparked joy. Kate Toon: Lots and lots. So, look, at the end of each week’s show, I like to read out a review from one of our lovely listeners. This review sparked joy with me. Thank you Kolonel Designs. “Have been listening to Kate and her podcast for some time, and it really opened my eyes to how much I knew about SEO. I’ve also followed other podcasts previously, but reduced my SEO playlist to just Kate.” Awesome, Kon Marie your playlist, “Due to the way she delivers her teaching. For anyone starting out, or even those looking for aha moments, make sure you have this one on your playlist. Thanks, Kate.” And thanks to your for listening. Kate Toon: If you did like the show, don’t forget to leave a five-star rating and review on iTunes or Stitcher or wherever you found it, and you can help other people learn more about the lovely world of search engine optimization. You’ll also get a shout out on the show. 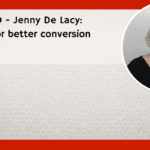 As I said, don’t forget to check out the show notes for this episode at www.therecipeforseosuccess.com where you can learn more about Marieke, check out links to her various bits and bobs and read her lovely article about site structure. Kate Toon: Finally, don’t forget to tune in to my two other podcasts, The Hot Copy Podcast, a podcast for copywriters, all about copywriting. And also, The Confessions of a Misfit Entrepreneur about how to have a busy business and succeed. So, that’s it for this time. Thanks for listening and happy SEOing. 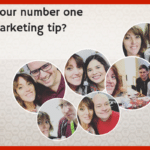 What’s your number one digital marketing tip?